"I Guess You Were Right, Teacher Tom"
I don't think anyone who knows me would say I'm a cruel person, but I can't help myself. When anyone falls or gets hit in the head by something, I laugh. No, not a big, old, mean-spririted belly laugh, but it's still clearly a guffaw, one that explodes from my chest far too quickly to be stopped. My mom did it too, even when it was her own kids landing on the pavement, so I come by it honestly, but I suppose it's a reaction that could be considered a real liability for a preschool teacher who is responsible for other people's sweet, innocent lion cubs. I've never had the lioness take off my head for it, but, you know, I could hardly blame her. Sometimes it comes in handy, of course, this knee-jerk reaction at the misfortune of others. It causes me a moment's pause, it means that when the child looks around the first thing she sees is a smiling face, and often in that moment the child decides she's going to laugh too, sometimes right through her tears. It is, I think, a much more productive response than rushing to her side with furrowed brow -- that usually just makes it hurt worse -- but I can see why it sometimes makes me come off as heartless, even if in the next second I'm holding her in my arms, cooing soft words. I can only hope that I've made enough deposits into my loving-caring-nurturing account that when this happens the balance is still in my favor. 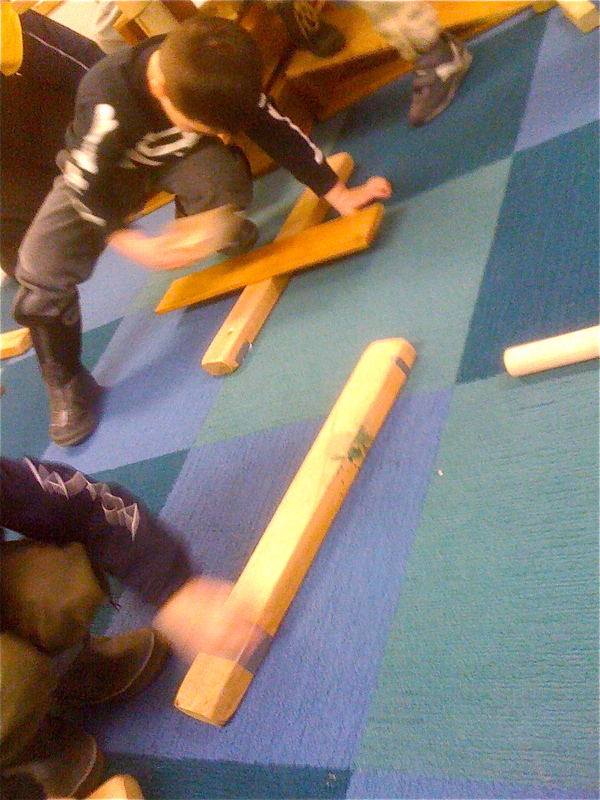 A couple years back, one of the guys, almost by accident, discovered a "catapult" made from wooden blocks. Before anyone knew what was happening, he'd stomped on one end, launching a small block high into the air, where it came down directly atop his own noggin. I laughed, then said, "You hurt yourself." He laughed too, "No, I didn't. It didn't hurt at all." As he re-loaded the catapult for a second launch, I said, "This time you might hurt yourself." "No I won't." He stomped again and ducked almost simultaneously, causing the block to just miss his head. He repeated the process several more times, sometimes avoiding the falling block, sometimes not. A couple other kids gave it a go, each of them hitting themselves in the head. The whole time I was making the informative statement, "The blocks are hitting people in the head," although chuckling all the while. One of his friends said, "Cool! I want to try it." I said, "You're going to hurt yourself. The blocks are hitting people in the head." He ignored me, forgetting to duck and shooting the block with great velocity into his own eye. Yes, I laughed again, even though this time it looked like it might have really hurt. As he held his eye, I said, "Let me see it." He uncovered his face to reveal a red mark just below his eye and a huge smile that covered for the pain. He said, "I guess you were right, Teacher Tom." I said, "I think you're going to have a black eye. I'll get an ice pack." He answered, "What's a black eye?" "It's when you get hit by something hard by your eye and you get a big bruise. Check the mirror, you already have a red mark." He looked into a classroom mirror. I said, "I'll get the ice pack." He answered, "No thanks, I think I'm going to need the black eye to remind me not to do that again."